On August 5, 1914, a stoplight was installed on the corner of East 105th Street and Euclid Avenue in Cleveland, Ohio. It had two colors, red and green, and a buzzer to provide a warning for color changes. This allowed police and fire stations to control the signals in case of emergency. It was the world's first traffic light. Come along with Tidbits as we fight our way through traffic! THE FIRST FACT "Traffic" comes from the Italian "traffico" meaning "to trade." Don’t be a chicken. Donate Blood. Donate Blood in August & Receive a Free Snack Size Boneless or Traditional Wings *Dine in Only. 5. What U.S. state has more miles of highway than any other state? 6. What percentage of accidents happen less than 25 miles from home? 7. What percentage of accidents happen at less than 25 mph? 8. Name the rock song that contains this lyric: “Go and write me up for 125, post my face, wanted dead or alive......."
1. On average, how often is a typical driver involved in an automobile accident? 2. What time of the week do more accidents happen than any other time of the week? 3. What percentage of land in a typical American town is paved? 4. How many million miles of roads and streets are there in the U.S.? FATHER OF TRAFFIC SAFETY •	William Phelps Eno was nine years old in 1867 when he went to New York City with his mother. When the performance at the New York Opera House let out, their horse and carriage got involved in the subsequent traffic jam which required two hours to untangle, even though only a dozen carriages were involved. Eno never forgot the experience, and devoted the rest of his life to improving traffic control. •	This became increasingly important as horses were replaced by cars on the streets of the nation. In 1903 Eno published "Rules of Driving" which became a primer for drivers. He invented such rules of the road as slow traffic keep right and passing allowed on the left only. He invented one-way streets, safety islands, rotary traffic, pedestrian crosswalks, the stop sign, the taxi stand, and traffic cops. •	Still, Eno felt that stoplights would never work and traffic cops would always be needed at intersections. He preferred rotaries to stop signals as the best way to keep traffic flowing. This concept strongly influenced the building of Piccadilly Circus in London and the rotary around the Arc de Triomphe in Paris. He was awarded the cross of the Legion of Honor by the French government after World War I because his traffic system allowed the French to speed 60,000 troops to Verdun to halt the German advance toward Paris and turn the tide of the war. •	Eno lived long enough to see his ideas implemented throughout the country. He also made many trips to Europe and Asia to help them with their traffic control problems. William Eno died in 1945 at the age of 86.Throughout his life, William Eno, known today as "the father of traffic safety," hated to drive. His chauffeur drove him everywhere. FACT •	15% of drivers get 76% of all traffic tickets. to High Efficiency Glass On 4-Season Solariums when ordered by August 31 Create your personal Haven with a Sunspace enclosure or sunroom and take advantage of the warmth from the sun without the bugs and wind! Get started by stopping by Sunrooms ‘Plus’ today! 4. In 2013, Sebastian Vettel became the first driver in Formula One history to have 1. Dallas Cowboys star Emmitt 9 successive victories in one Smith holds the NFL record year. Who held the old mark? for most consecutive 1,0005. The New York Yankees yard rushing seasons. How had two Cy Young Award many is it? winners in the 1970s. Name 2. Name the last American male them. before Meb Keflezighi to win 6. Four MLB pitchers have won the Boston Marathon. the Cy Young Award four or 3. Wayne Gretzky was awarded more times. Name them. the Hart Memorial Trophy 7. Which MLB franchise has for the NHL’s MVP the most the most Cy Young Award times. How many was it? winners? STOP SIGNS •	Although William Eno invented the stop sign, it was the Mississippi Valley Association of State Highway Departments who came up with the sign’s iconic shape. In 1923, they developed a system of street-sign shapes still used today. Their idea was that the more sides a sign has, the higher the danger level it invokes. They reasoned that the circle, which has an infinite number of sides, screamed danger, so it was used for railroad crossings. The octagon, with its eight sides, was used for stop signs, the diamond shape was for warning signs, and the rectangle and square shapes were used for informational signs. •	It took a bit longer to determine the stop sign’s color. It wasn’t until 1935 that traffic engineers created the first uniform standards for the nation’s road signage. They recommended stop signs be yellow with black letters. The 1954 revision, however, called for the stop sign to be red with white letters. Before then, they could not produce a reflective material in red that would last without fading. It just was not durable. It wasn't until a suitable product was invented in the 1950s that stop signs became red. NO STOPING ALLOWED •	In 1944, the newspaper in Durham, S.C. reported that a local man had been taken to traffic court for parking his car in front of a sign that said, “No Stoping.” The man pleaded not guilty. The sign should have said, “No Stopping” (with two P’s). He argued that “stoping” meant to extract ore, and he certainly had not been extracting ore. He moved that the case be dismissed. The judge agreed, and the spelling on the sign presumably was corrected. FACT •	A quarter of all car accidents are rear-end collisions. MOMENTS IN TIME • On Aug. 16, 1920, Cleveland Indians shortstop Ray Chapman is struck in the temple by a ball pitched by Carl Mays of the New York Yankees. He died 12 hours later. After Chapman's injury, it was mandated that scuffed or discolored balls be replaced with new white ones, making them easier to see. a 400-kiloton device in Kazakhstan. Known as the "Layer Cake," the bomb was fueled by layers of uranium and lithium deuteride, a hydrogen isotope. • On Aug. 15, 1969, the Woodstock Music Festival opens on a patch of farmland in White Lake, New York. By the time the gates opened, more than 400,000 people were clamoring to get in. Those without tickets simply walked through gaps in the fences, and the organizers were eventually forced to make the event free of charge. • On Aug. 17, 1933, New York Yankees first baseman Lou Gehrig plays in his 1,308th consecutive game, breaking former Yankee Everett Scott's record for consecutive games played. Gehrig would go on to play in 2,130 games in a row, setting a record that • On Aug. 11, 1973, "Ameriwould stand for over half a century. can Graffiti," a nostalgic coming-of-age tale steeped in the • On Aug. 13, 1948, U.S. and Brit- car-centric culture of suburban Caliish planes airlift a record amount fornia, is released in theaters. The of supplies into sections of Berlin film went on to become a sleeper hit. under American and British control. Despite terrible weather, crowded • On Aug. 14, 1985, Michael Jackson airspace and exhaustion of the pi- purchases the publishing rights to the lots and crews, more than 700 Brit- vast majority of the Beatles' catalog ish and American planes brought for $47 million, outbidding even Paul in nearly 5,000 tons of supplies. McCartney. In later years, the catalog -- now estimated to be worth in excess • On Aug. 12, 1953, less than a year of $1 billion -- allowed Jackson to reafter the United States tested its first main solvent by serving as collateral hydrogen bomb, the Soviets detonate for several enormous personal loans. ACCIDENTAL SIGNS •	In 1751 George II of England erased a debt he owed to George Deakins by telling him he could have 600 acres of land in Maryland. Deakins was determined to get the best 600 acres he could, so he hired two sets of surveyors to look over the land and tell him what they thought. Neither team knew about the other team, so Deakins was amazed when each group recommended the same plot. Deakins considered this an accident of fate and dubbed the land "The Accidental Tract." Today the town that grew up there is known as Accident, Maryland. They have trouble preventing their interstate signs from being stolen. The signs say, "Accident Ahead." UNIQUE TRAFFIC CONTROL •	The town park in Napa, California had plenty of traffic control signs, stop signs, and signs asking drivers to slow down. Still, the park was plagued by accidents. Finally the City Park Superintendent purchased 85 chickens, releasing them in the park to act as traffic controls. The chickens did nothing except strut around, completely oblivious to all traffic. But drivers were so reluctant to run over the birds as they wandered around on the roads that they slowed down considerably. The accident rate plunged and only nine birds were lost the first year. R.I.P. 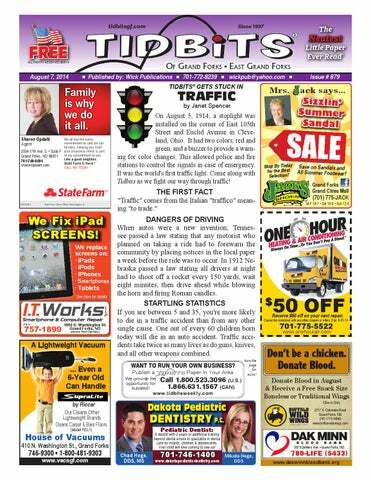 •	On November 16, 1983, folks in Caldwell, Idaho removed "Red-Eyed Pete," the last traffic light on Interstate 80. After its demise, people were able to drive coast-to-coast nonstop. Three morticians were on duty when Red-Eyed Pete was dismantled, laid out in a horse-drawn hearse, and carried a mile to his grave. The mayor delivered a eulogy as the casket was lowered into the ground. His headstone read, "Here lies RedEyed Pete, the one red light you need no longer beat." •	Henry Seth Taylor was a natural tinkerer and a watchmaker by profession. Born in Stanstead, Quebec, in 1833, he loved to experiment with machines. He invented the first sofa-bed and an early version of a phonograph. He is best known, however, for building Canada's first steam-powered car. •	Self-propelled steam-powered horseless carriages had been around for years by the time Taylor unveiled his own model, but Taylor's had the distinction of being the first car built in Canada. •	He designed the steam buggy and created much of it himself, machining cylinders, drive shafts, and axles. The boiler was at the rear of the carriage and was connected to a front water tank by two rubber hoses. A hand throttle controlled the speed both forward and reverse, and a tiller controlled the steering. Because the local roads were badly rutted and there seemed little chance of Taylor’s losing control, he never installed brakes, an oversight he would later regret. •	In September of 1867, the Stanstead Journal reported on the newly completed “steam buggy,” which was to be unveiled at the upcoming Stanstead Fair. “This mechanical curiosity is the neatest thing of the kind yet invented, the whole carriage, engine and boiler only weighing 500 lbs. It is intended to run without noise or smoke, and will probably show some fast time.” •	The day that Taylor drove his new buggy onto a field at the Stanstead Fair, a hose burst, releasing steam and bringing the vehicle to a halt. Taylor had to push it off the field amid ridicule from onlookers. Despite the humiliation, Taylor made the necessary repairs and continued to drive his steam buggy around town. West Nile Virus in Local Mosquitoes!!! Several pools of mosquitoes from Grand Forks have tested positive for West Nile virus (WNV). This is a serious disease that is transmitted by mosquitoes. Most people infected with this disease will have no symptoms or mild symptoms but this is a serious disease and can be fatal. The Grand Forks Public Health Department urges citizens to take personal precautions to avoid mosquito bites. The type of mosquito most common for transmitting WNV is present in our area and is most active from dusk until dawn. Please take the necessary measures to avoid mosquito bites. HENRY SETH TAYLOR (continued): •	On a subsequent drive through the village, however, Taylor and his car were involved in what might be described as the first automobile accident in Canadian history. While descending a steep hill, the car began to pick up speed, careening out of control. Without any brakes and with a fully stoked, scalding-hot boiler at his back, he had no choice but to jump out of the vehicle, which overturned at the bottom of the hill. The car was a wreck, and its frustrated builder gave up on it, turning his attention instead to building a steam-powered yacht. GRAPHIC NOVELS Expires 8-31-14 © 2014 King Features Synd., All rights reserved. NUGGET OF KNOWLEDGE • When humans first settled the eastern seaboard, jays were common there. As more and more people began moving in, jays disappeared from the cities and were found only in the country. Country hicks who lived where the jays lived came to be known as jays. When they came to the city, they did not know to follow the traffic laws. They crossed in the middle of the streets. This became known as jay-walking. • The first auto fatality happened in London in 1896 when Bridget Driscoll froze in fear at the sight of an oncoming car, which knocked her down (while travelling only 4 mph) and killed her. • The first speeding ticket was issued to Walter Arnold in 1896 for travelling 8 mph through Wood, England, thus exhibiting "shocking disregard for health and civility." •	After salvaging its boiler for his new yacht, Taylor scrapped the car in the back of his barn, where it languished until long after his death in 1887. It was nearly a century before it was re-discovered and taken to the United States. Restored by an antique car buff (this time with brakes added), it was returned to Canada, where it is now the property of the Science and Technology Museum in Ottawa. Finally receiving the recognition it deserved, "Taylor's Folly" was depicted on a stamp in 1993. •	In 1904 Canada's automotive industry began with the establishment of Ford Motor Company of Canada, Ltd. By 1913 there were some 50,000 motor vehicles in Canada; between 1918 and 1923, Canada became the world's second largest vehicle producer and a major exporter of automobiles and auto parts. •	Today, Canada is the eighth largest auto producer in the world and the third largest exporter, after Japan and the U.S. More than 80% of Canadianmade cars are exported. The automotive industry is the largest manufacturing sector in Canada. Canada has one of the world's highest ratios of automobiles to inhabitants, with more than 33 million people and more than 18 million registered automobiles, of which more than 75% are private cars. CAR DESIGNERS • Most people think Henry Ford was the first person to construct automobiles using an assembly line. But they’re wrong – the idea was actually invented by a man whose first name was Ransom. • Ransom was born in Ohio in 1864. His father was a blacksmith who owned a machine shop, so Ransom grew up tinkering. He developed an internal combustion engine and founded his own car company in Lansing, Michigan in 1897. The company, and the car he produced, were named after him. The engine was successful but the car was not, so he moved the factory to Detroit and started over. • For the next several years his company produced more cars than any other American company. General Motors bought the company in 1908 and produced Ransom’s cars until they were discontinued in 2004. • In 1912, Henry Ford took Ransom’s idea for an assembly line and added a conveyor belt, which allowed him to increase production while also dropping the price. Though Ford is generally thought of as being the father of the auto industry, the title truly belongs to Ransom. What was his last name, given to a car and a company? (answer at top of next page) FAILED DESIGN • In 1913 the Jackson Motor Company came out with a new model called the Duck. The steering wheel and brake pedal were located in the back seat, where the driver sat. Passengers sat in the front, where they completely blocked the driver's view. • It was ancient Greek philosopher Plato who made the following sage observation: "Good people do not need laws to tell them to act responsibly, while bad people will find a way around the laws." • How would you like to brush your teeth with salt, chalk or ground brick? The first tooth powders that were used with toothbrushes were made of just such materials. • When you think of hibernating bears, you typically imagine some cozy cave in the woods, right? Well, the next time you're out for a winter hike, you'd better pay close attention to exactly where you're going; some bears spend the cold season curled up on the ground in large nests made of branches. • Greyhounds have better vision than any other breed of dog. • Every May, horse lovers flock to Churchill Downs in Louisville, Kentucky, to see the world's finest thoroughbreds race in the Kentucky Derby. • This time the car sold better, until his factory burned down and he had to start over again. In 1901 he got the idea for an assembly line, which increased his output from 425 cars in 1901 to 2,500 in 1902 and 6,500 in 1905. It was the first car to be produced in quantity. DIFFERENCES: 1. Backpack pocket is missing. 2. Hat is missing. 3. Binoculars are missing. 4. Limb is shorter. 5. Sign is missing. 6. Log is smaller. © 2014 King Features Synd., All rights reserved. •	The Duesenberg brothersboth were makterests. He co-founded thebetter First car Nationers were businessmen, though, and al than Bankthey and the First Congregational Church. the faltered andoffailed during the Hecompany was elected the mayor Moline in 1873, Great name lives whereDepression. one of his However, first actionstheir – the replaceof thethe city’s open drains with a for sewer onment because common abbreviation the pipe system saved lives reducvehicles they –built hascountless come into ourby language the spread disease.something excellent, asing a slang wordof meaning or extraordinary. What’s the word? • powerful, The original John Deere logo, registered in Answer below. a deer that was native to Afri1876, depicted ca. Thirty-six years later, in 1912, it was reFACT placed with the image of a North •	70% of travel done in America is byAmerican car; 28% white-tailed deer. In the decades by plane; the rest by bus and train. that followed, the now-familiar “outline” logo took Answer: Doozy. over as the symbol of the John Deere brand. Information in the Tidbits® Paper is gathered from sources considered to be reliable, but the accuracy of all information cannot be guaranteed. Sports Answers 5. Sparky Lyle 1. 11 seasons (1977), Rod (1991-2001) Guidry (1978) 2. Greg Meyer, 6. Roger Clemens in 1983 (7), Randy John3. Nine times son (5), Steve 4. Michael Carlton (4), Greg Schumacher Maddux (4) won 7 straight 7. Dodgers, 11 in 2004. Tidbits Laughs On Highway 89 a cop stopped a man who had been speeding along at nearly 90 miles per hour. "Didn't you see the speed limit posted back there?" "Sure I did," replied the man. "I thought it said 89 miles per hour." "Boy," said the cop. "I'm sure glad I caught you before you turned onto Highway 200!" "Traffic," "Henry Seth Taylor" and "Car Designers"